Been busy putting up new auctions today. I'm enjoying the game of ebay. It's fun and has been a nice little side business over here. Loving my new camera! It's a Sony Cybershot, works like a charm. My mom is bringing a bunch of old beads and we are going to sell grab bags online. I hope she sells tons of them. Yes, my mom is coming to visit. She has had enough of New Orleans for a few weeks and needs a break. We are going to make jewelry together all week. She's bringing her soldering iron and her little torch. We are going to make collage pendants and she's going to show me how to make my own headpins and earwires. Then, we'll be doing a market day next Saturday, selling all the fun things we make! Life is sweet. She came fluttering into my studio today. Along with some snowmen, little candy-inspired earrings and other funky ideas that haven't quite made it from my sketchbook unto the bead table. For my holiday line, I want to create some fun and playful pieces. I've been giggling all day at the sight of this silliness. What am I thinking? I'm always so serious, I feel like now is a good time to create whatever fits my whimsy. After all, in life and in art, great rewards are given to those who step out on the edge and soar into the unknown! And the little candy earrings. Visit my website to see all the hard work I've been up to! Fortune & Fame - or not! Well, would you look at that, I've been published in a book and I didn't even know it! 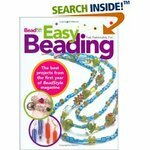 Easy Beading by BeadStyle Magazine, features the best projects of their first year. I sold all rights to the magazine for the article, so they can reprint them and sell them however they would like. I knew this when I signed the contract and felt the free advertising out weighed selling the rights. Here is a good run down on the basics of selling magazine articles. The book has my lariat necklace republished. Which I found out from a customer from Australia. (Thanks Lynn!) I'm excited about this because it gives me more exposure from that one-time article sale, a book has a much longer shelf life than a magazine. And being in the magazine has been very good for bead sales. I loved working with BeadStyle and if you are looking for a little fame, it's a good place to start. To find a magazine's submission guidelines, check out their website. But I think I will hold on to the necklace and earring set below and keep that to go in the book I'm writing. 1. Don't do the dishes more than once a day or not at all! 2. Don't answer the phone, emails or open your mail. 3. Send children to school for 8 hours of uninterrupted time. 4. Laundry doesn't need to be folded, stuff it into the drawers and don't iron, just throw it in the dryer for a few minutes. It's only electricity. 5. Don't cook. What are restaurants and take out for? 6. Don't get more than 5 hours of sleep a night. 7. Don't waste time picking up your supplies from one project to the next, just push them aside for the next batch of goodies. 8. Shower, come on, that's like 10 minutes you could use to create. 9. Ignore husband when he gets home, working into the wee hours of the night. 10. No house cleaning, dust bunnies make good studio mascots. I'd be laughing, except that is really how I do it all! Well, maybe not that bad, but close. 2. T.V. - ah, LOST! among a host of other new shows I love to watch at night. 3. looking for stuff that I misplace and general disorganization. 4. staying up too late, not a productive time for me. 1. Everyone does housework, not just me. 4. Keeping my monthly to-do list and working on it a little every day. Having a road map helps me at least head in the right direction. Time saving tips? Good websites on the subject, leave them in the comments, I could use a few pointers! The girls and I have been having fun collecting acorn tops for little craft projects. Some of them found their way unto my work table last week. These are made using a new clay called precious metal clay, that turns to fine silver after it is fired in a kiln. Actually, it's fine silver particles combined with a clay binder. The clay is organic and burns away, leaving only the fine silver. You didn't know I was an alchemist, did you? Now, if only I could turn dirt into gold...hmm. Anyway, I covered the real acorn tops in silver (the acorn burns away in the kiln, leaving only the fine silver) and the bottom is a new technique in polymer clay that I've been experimenting with. These fall inspired acorn charms can be found on eBay, right here. If you are not a jewelry-making person, you could simple put one on a silver chain. One for you, one for your best friend, one for sister...or however your gift-giving list goes! And I hope you give yourself the gift of time to be creative this week. I listened to a great radio program the other day that gave two great tips. Listen here. I'm not a fiber artist, but I loved her ideas. 1. Do something creative every day, even if it's for 5 minutes. What can you do for 5 minutes today? The second tip was genius. Gather the projects into zip lock bags, all the components you need for what you'd like to make. Then when you have 5 minutes, pull out one of the bags and start to work on it. I love this idea. Now you could adapt that idea, use a shirt type gift box if you have objects that need to lay flat, label them on the side or put them in clear plastic containers, ready to go.